Chesterfield beat Boreham Wood in a highly-entertaining National League encounter. A Steven Rigg penalty ensures Gateshead end their six-match winless run with victory against Chesterfield. Goalkeepers Jack Butland, Joe Anyon, Kasper Schmeichel and Joe Hart acted as pallbearers. A Walsall fan's unexpected ferry ride to Fratton Park and other things you may have missed in Saturday's EFL games. 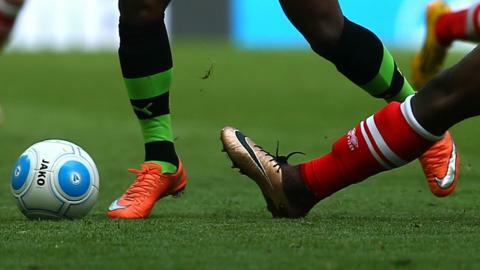 Mother nature cruelly robbing a teenager of a wonder strike is among five things you may have missed from Saturday's EFL matches. As Jamie Fullarton leaves Notts County after 10 weeks in charge, BBC Sport looks at five things you may have missed in the Football League.